One of the most underused features of iTunes, in my experience, is that you can rate each track on a scale of one to five stars. Ratings are helpful on their own for finding your favorites, but they’re also immensely useful for creating smart playlists in iTunes. But rating tracks is a bit of a hassle: You’ve got to stop what you’re doing, switch to iTunes, find the currently playing track, and then click the desired rating. A number of third-party utilities aim to make it easier, or at least more convenient, to rate tracks, and my favorite remains Potion Factory’s $1 I Love Stars (Mac App Store link). I first reviewed I Love Stars back in 2009, but the utility has since gained some useful features and is now offered through the Mac App Store. 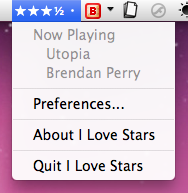 I Love Stars puts iTunes’ rating scale right in your menu bar. If a track already has a rating, you see that rating without having to switch to iTunes. I Love Stars also supports iTunes’ album ratings; if you’ve rated an album, the album rating is displayed for each track in the album that doesn’t have an individual track rating. Perhaps my favorite feature is the option to remind you to rate each song. Whenever iTunes gets about two-thirds of the way through an unrated song, I Love Stars can flash its menu-bar scale, play an alert sound, or both, jarring you out of your music-listening stupor to give the track a quick rating. And if you find iTunes’ five levels of rating too limiting, I Love Stars lets you give tracks half-star ratings: 0.5, 1.5, 2.5, 3.5, or 4.5. Finally, you can assign keyboard shortcuts to whole-star ratings (1, 2, 3, 4, and 5), as well shortcuts for increasing or decreasing the rating in full- or half-star increments. There are a number of full-featured “iTunes controller” programs that include track-rating options, including the stellar CoverSutra. But for simply rating tracks, I’ve found no better solution than I Love Stars. I actually use it with CoverSutra.